It seemed miraculous enough to Paul Gilmour that police recovered his bike, but even more surprising was the thief's handwritten apology note that came along with it. "A police officer brought me my bike, undamaged. But there was also this handwritten letter from this guy," Gilmour, 41, of Portland, Ore., told ABCNews.com. "Apparently, when he was picked up by police, he had asked for a piece of paper and a pen and wrote out this apology letter for me. And he included $10 out of his pocket to help pay for a replacement lock." 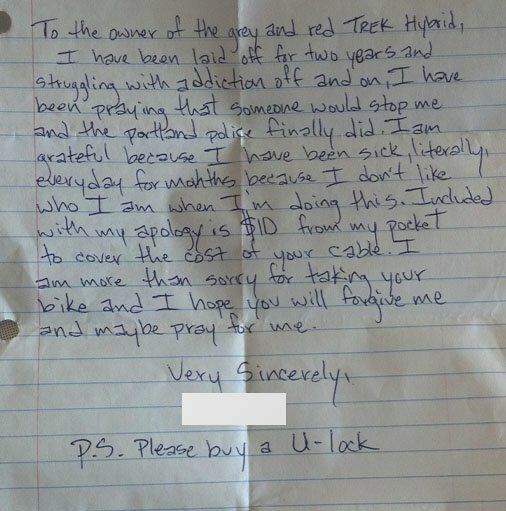 The letter, handwritten by the thief, apologized for stealing the bike and explained why he had committed the crime. "The letter stated that he had been laid off for a couple years, was dealing with addiction, and was really unhappy with his life and the things he's been doing, such as this," Gilmour said. "He was glad he was caught red-handed with my bike and said that he needs help." The thief even offered a piece of advice to Gilmour. "It said, 'P.S. Get a U-lock.' So that's what I did. I went right out and got a U-Lock," Gilmour said. Apparently, the bike was an easy steal for the thief, because up until now, Gilmour had used an easy-to-cut cable lock. So when Gilmour got out of his multimedia design class Tuesday afternoon at Portland Community College's Cascade campus, he realized he had no way to get home. Gilmour had locked up his Trek Hybrid bike outside of his classroom building earlier that morning, and when he returned to the spot he left it, the bike was no longer there. "I came out of class and I didn't see my bike. So there's like 70 bikes there. They're all locked up from all other students. I looked for about 15 minutes," Gilmour said. Gilmour's classmates suggested he report the stolen bike to campus security, which he promptly did. "I called it into campus security, and they asked me to describe it because Portland police said they had recovered it, and that the person admitted it was stolen from PCC (Portland Community College) Cascade," said Gilmour. Because Gilmour was able to perfectly describe the bike, the police met with him to return it to its rightful owner. However, the letter was an unexpected added bonus. This thief's act of sincerity even had the arresting officers scratching their heads. "The officer that returned me my bicycle, he said in the 28-and-a-half years he's been on the force, people are always apologizing because they've been caught. But in all that time, this is the first time he's interacted with someone so sincere," said Gilmour. Although Gilmour is grateful to have his bike back, he's not entirely sure how to feel about the rare, yet lucky situation. 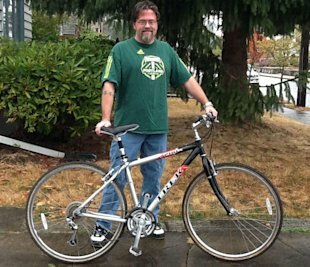 "I have such conflicting emotions about the experience - between being another statistic in Portland of a stolen bike and how frustrating it was, to the elation of how rare it is to get it back and being able to share my story. "I have no choice but to forgive this guy," he said. "It's just such a bizarre mix. He's obviously got issues and he's going to work through it, and he'll get his help now. The whole change of heart this guy had is really interesting."